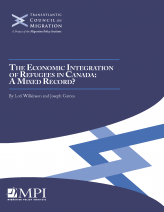 Home > The Economic Integration of Refugees in Canada: A Mixed Record? Since the fall of 2015, refugee resettlement in Canada has risen dramatically as the Trudeau government committed itself to admitting at least 25,000 Syrian refugees—a goal accomplished by the end of February 2016. As Canada expands its resettlement efforts, ensuring the labor-market integration and self-sufficiency of these new arrivals is a major challenge. Refugees in Canada have experienced mixed success when it comes to economic outcomes. While their employment status and income levels do, on average, catch up to those of native-born Canadians over time, full integration can still take more than a decade. In the interim, refugees tend to experience higher rates of unemployment than other immigrant groups and the native born. Two of the strongest predictors of labor market success are proficiency in English or French and educational attainment. Receiving recognition for academic and professional credentials earned abroad has posed a particular challenge for refugees. This report provides an overview of the key components and features of the Canadian refugee resettlement system, and examines available data on the labor-market integration and outcomes of refugees, including by resettlement pathway, finding that those who are privately sponsored in some ways have better outcomes than those resettled by the government. The authors draw on data from two large surveys, the Pan Canadian Settlement Survey and the Western Canadian Settlement Survey, to assess outcomes of recent arrivals and look ahead to the challenges that Syrian newcomers may face.